This blog introduces users to a free best OST recovery software that converts orphaned or inaccessible OST into PST file. Read on to know the features, functionality, and advantages of the software. 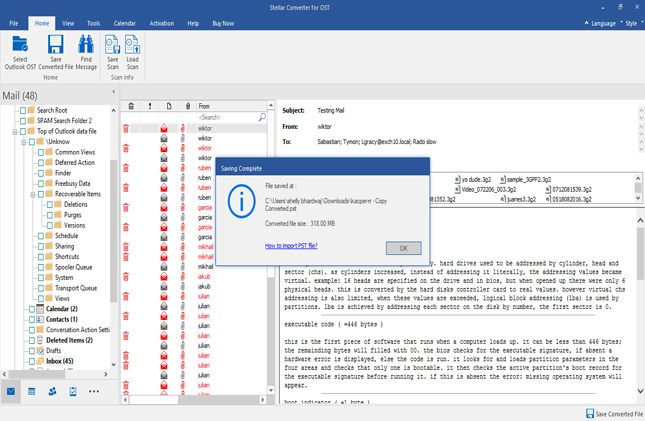 The Offline Outlook Data OST File becomes orphaned OST file and hence inaccessible due to several reasons, such as hardware failure of the hard disk drive, synchronization issues with Exchange Server, virus or malware attack, sudden Outlook crash/termination and many more. All these, in turn, make the stored data items, such as emails, attachments, calendar, contacts, tasks and journals in OST file inaccessible following which all business communication in one’s organization is stopped, leading to massive losses. Certainly, this is quite a disturbing and unfavorable situation and brings in need of an OST recovery software. 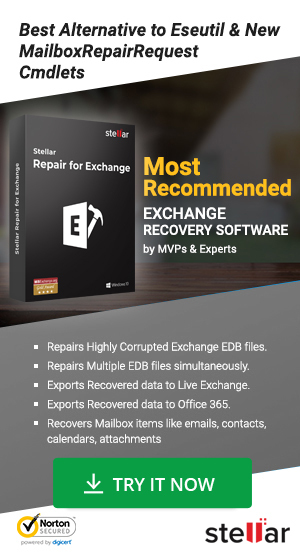 Solution: Try Stellar Converter for OST to recover all items in OST File. In a free demo, you can easily save 20 items/folder. 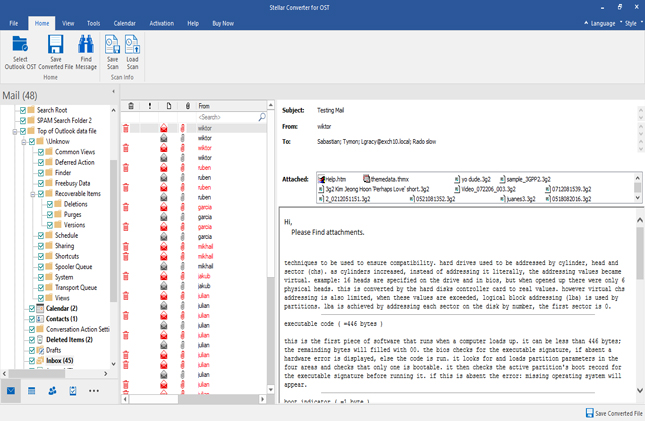 Supports Latest Outlook 2019 version. Download, install and launch Stellar Converter for OST. Click on ‘Browse’ or ‘Find’ tab as per need to select the orphaned OST file. Click on the ‘Convert’ tab. After clicking on the ‘Find’ tab, the ‘Find Mailbox’ dialog box opens up as shown in the image below. Choose the drive from the drop-down menu. Click on the ‘Find’ tab. Note: All the OST files are enlisted with ‘Name’, ‘Size’, and ‘Created date’. Select OST file and Click on ‘Convert’ tab. The OST to PST conversion process starts. This is shown in the image below. 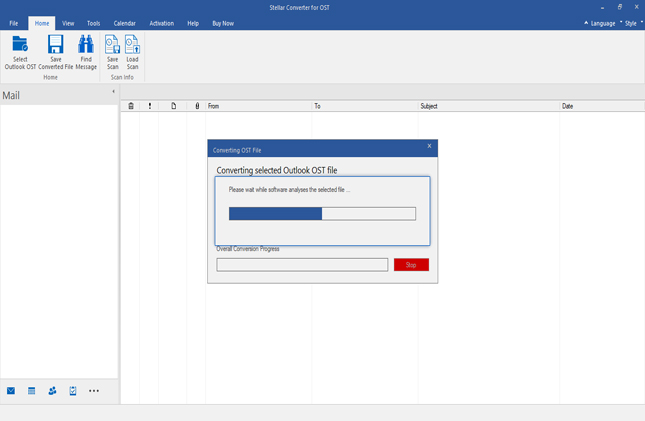 In this preview window, all the existing data items in Outlook mailbox folders are shown on the left side. 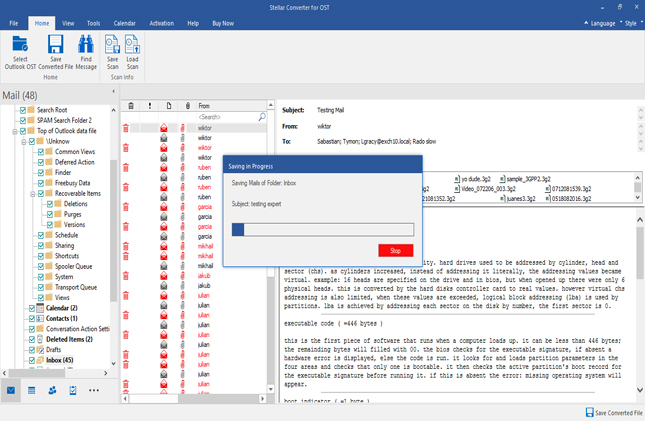 You can click on each, one at a time, to see the preview of data items, such as emails and their attachments, contacts, calendar, tasks, notes, journals, etc. Click on the ‘Save Converted File’ tab present in the ‘Home’ menu and at the bottom-right corner of the tool’s GUI to save the converted OST file.With this, the ‘Save As’ dialog box providing multiple saving options: PST, MSG, EML,RTF, HTML and PDF pops up. Select the desired file format by clicking on the radio button. Click on the ‘Browse’ tab to choose a location and save the file. Click on the ‘OK’ tab. Finally, the file is saved at the chosen location successfully. Finding an efficient and best OST recovery software is uncommon and surprising but not impossible. And, this is proven by Stellar Converter for OST that users can download, install and launch absolutely free to convert 20 emails per folder from the OST file. Users having an orphaned or inaccessible OST file can use this free OST recovery software to convert the OST into PST or other file formats and access the stored data items. 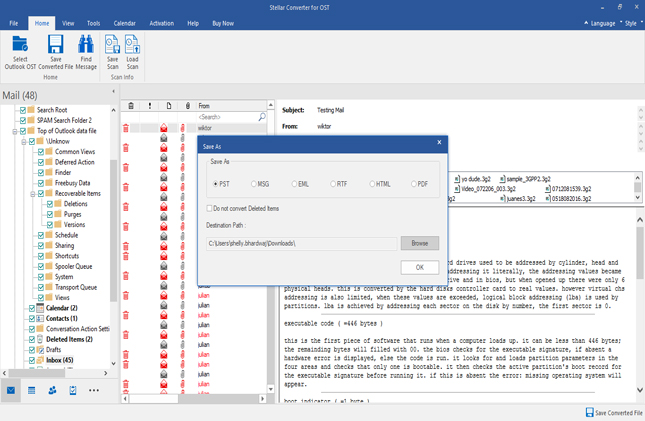 Encounter a large number of conflict items with OST file: Error Fixed!